Our mission is to provide our customers with top quality automotive performance products, competitive pricing and unparalleled service. Our team of dedicated employees strives to be a force of innovation within the industry. Our company is dedicated to maximum performance, excellent service, and true care and concern for the development of products and services for exotic car enthusiasts. Our customers are - and always will be - the most important facet of our business. Our commitment is to provide our customers with incomparable products, service, workmanship and fast order fulfillment. Our employees are the heart and soul of our company; the force to accomplish the mission. We do everything to ensure a safe and enjoyable working environment, encourage self-expression, nurture self esteem, promote education and practice positive human skills. Our community is the foundation of our civic responsibilities. We provide employment opportunities, protect the environment and contribute to - and support - the local economy. Our dyno-tested performance systems add exotic sports car sound, and are Street- and Track-proven. 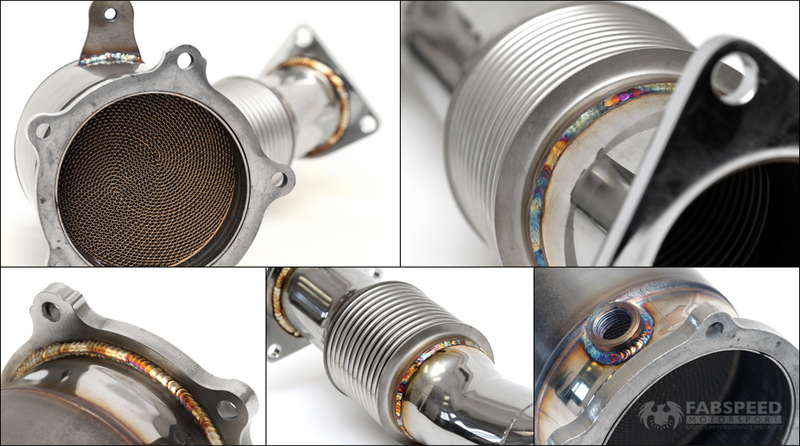 Fabspeed Maxflo exhaust systems are backed by a Lifetime Limited Warranty which is unique among the T304 Stainless Steel exhaust industry. All Fabspeed systems are polished to a mirrored show-car shine for ultimate quality and appearance. Fabspeed Motorsport has over 30,000 square feet of fabrication, sales and warehouse space at our main facility and an additional 200,000+ square feet of dedicated manufacturing space across the USA. Everyone on the Fabspeed team eats, sleeps, and breathes automotive performance and motorsports. From our trained and certified installation technicians and experienced product engineers to our enthusiastic and knowledgeable sales staff - we all love what we do! When you contact Fabspeed, you can be sure you’re talking to the most experienced individuals in the industry. Our backgrounds and knowledge base help us to better serve you in your pursuit of the ultimate performance and sound from your vehicle! 1986 - owner & founder, Joe Fabiani, purchased his first Porsche, a 1985 911 Carrera Cabriolet, and got involved with SCCA auto-x racing. This lead him to a few stints at Skip Barber racing school and eventually high performance track driving at Road Atlanta, Watkins Glen, Lime Rock, Summit Point, and many more courses. His first dedicated track car, a 1995 993 Carrera, went under the knife for a full RSR Clubsport conversion in 1994. When it came time to choose an exhaust, he was unsatisfied with the selection and quality of the aftermarket exhaust systems available at the time, so he set out to build one for himself. Word quickly spread and his results at the track spoke for themselves. Other Porsche enthusiasts wanted a piece of the action, and so Joe took the plunge and decided to give up his brokerage desk for his own machine shop. Fabspeed was born.Going digital in 2000, Fabspeed's website was one of the very first to produce and host videos highlighting our exhaust systems. Fabspeed’s first dedicated shop in Ambler, PA began refining the sound and performance of Porsche exhaust systems - notably the 993 Turbo and 930 Turbo - but why stop there? A complete exhaust package was developed for the Ferrari 360, the Lamborghini Gallardo, and soon more supercars filled the shop. Within a few years, business was booming. Joe had expanded the Fabspeed product line to include hundreds of different performance products for almost every model of Porsche. Within a few short years, that list would also include applications for Ferrari, Lamborghini, Maserati, Bentley, McLaren, Aston Martin, and more. In 2012we moved into our new 26,000sqft manufacturing facility and showroom in Fort Washington, PA.